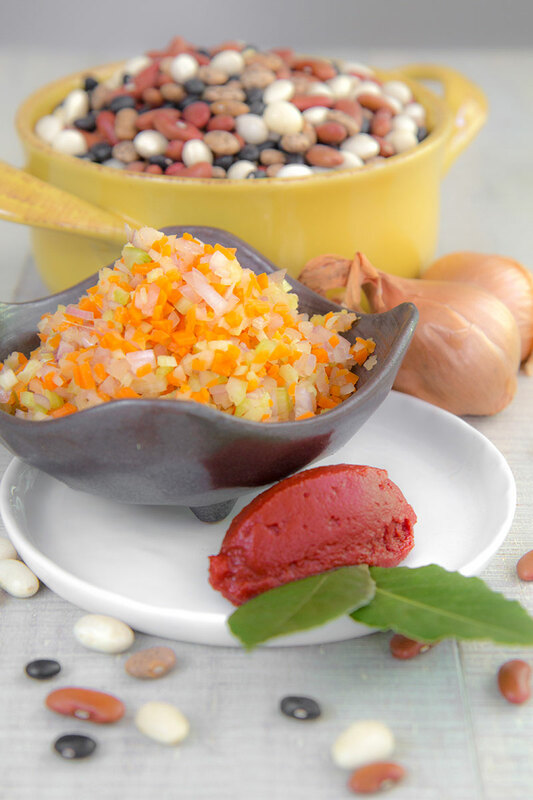 Bean sauce is an easy recipe perfect tossed with pasta, or served on toasted bread slices. Another way to serve this tasty vegan sauce is paired with fried eggs. In this case, I choose black, cannellini, pinto, and kidney beans, but you can select any beans you prefer! MIXED BEANS: CANNED OR DRIED? 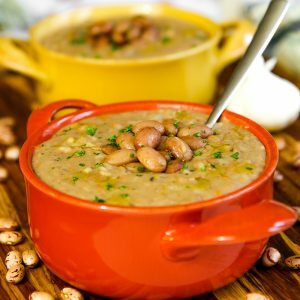 Canned or dried beans? Personally, the answer to this question is easy. If I have time to soak and to boil I choose always dried beans. 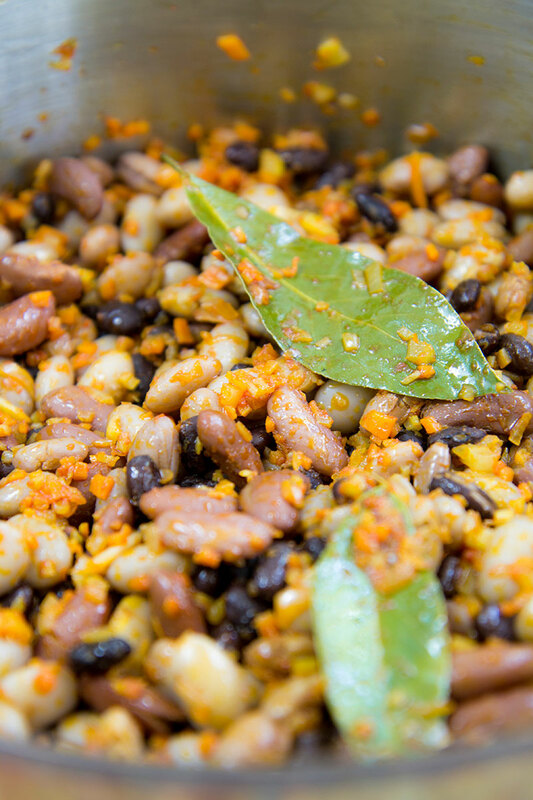 Otherwise, canned legumes permit to prepare this bean sauce very quickly! 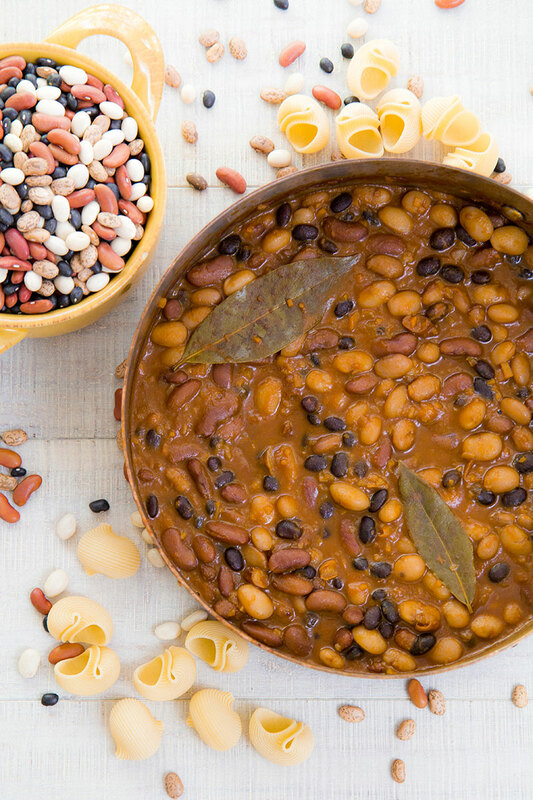 If you decide to make the bean sauce with canned beans, skip this paragraph. Otherwise follow the successive instructions. 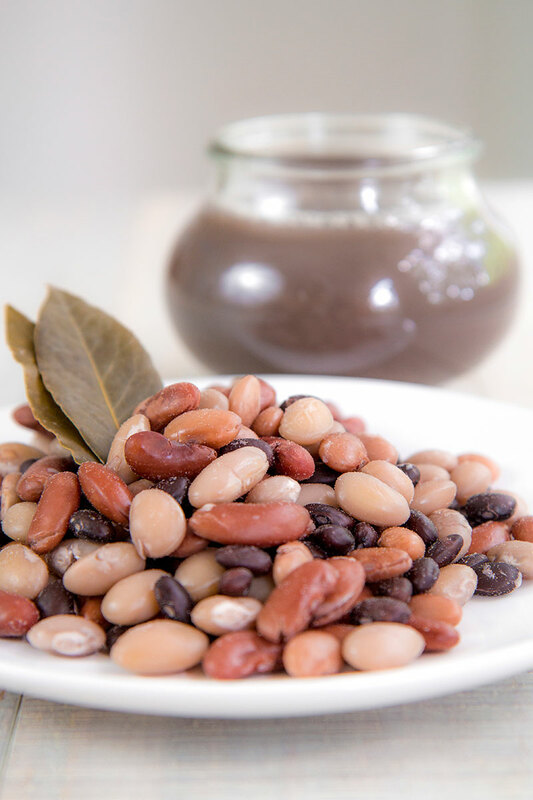 Rinse the mixed beans and pour into a bowl along with abundant water. 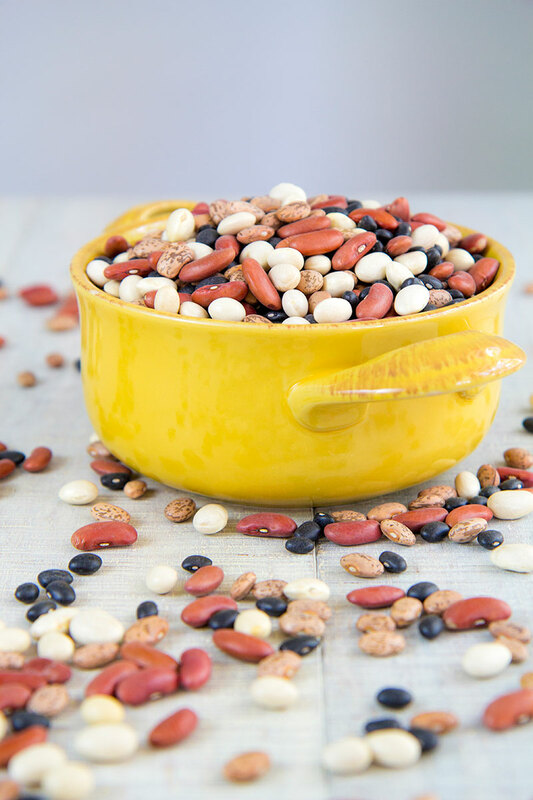 Soak the legumes at least 8 up to 12 hours. After that, raise the mixed beans and pour into a dutch oven or a thick-bottomed pot. Pour enough water to submerge the beans by 1 inch, then put the pot over medium/low heat. When the water starts to simmer, cover the pot. The beans must very gently simmering under the lid. Finally, cook the beans 40 to 60 minutes, until well cooked, but not mushy. Save the broth. Peel and mince shallots and carrots. Mince the celery as well. Now pour the olive oil into a saucepan. As soon as the oil is hot but not smoky, saute the vegetables until smooth and golden, then add tomato paste and bay leaves. Stir-fry a couple of minutes, then add mixed beans. Stir fry the legumes five minutes, then add tomato puree and 1 cup of hot bean broth or vegetable stock. Set the heat to let the bean sauce gently simmering, then cover the saucepan with the lid. Place a wooden spoon between the pan and the lid to let the liquid slowly evaporate. Cook about 1 hour, adding broth a little at time if necessary, and stirring occasionally. Add salt as needed only at the end of the cooking time. Eventually, the bean sauce has to be smooth, creamy, but not washy. The best shapes of pasta for this recipe are shells or rigatoni. Any short pasta fits good, but I can’t suggest long pasta like spaghetti. Fill up a pot with 6 quarter of water, then add the coarse salt. Bring the water to boil, then cook pasta al dente. 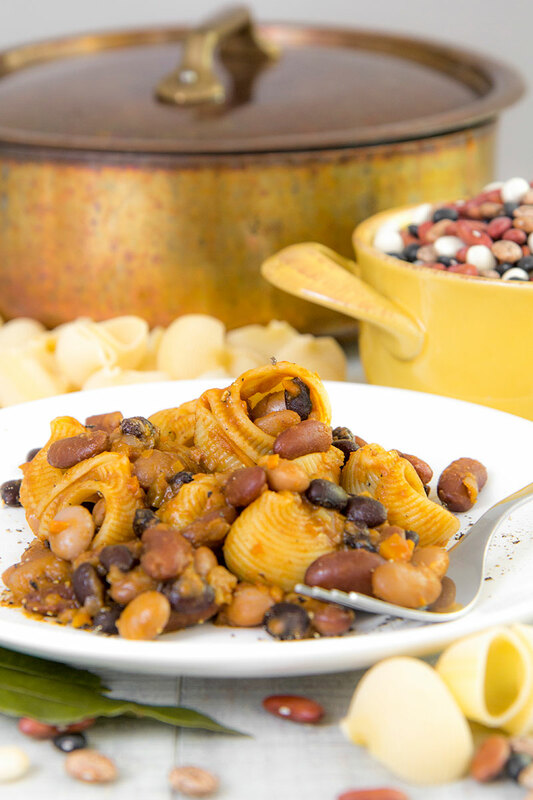 Finally, raise the pasta and toss with bean sauce. If the sauce results too thick, add a few spoon of bean broth, then toss again. Complete with a dash of black pepper and serve immediately.